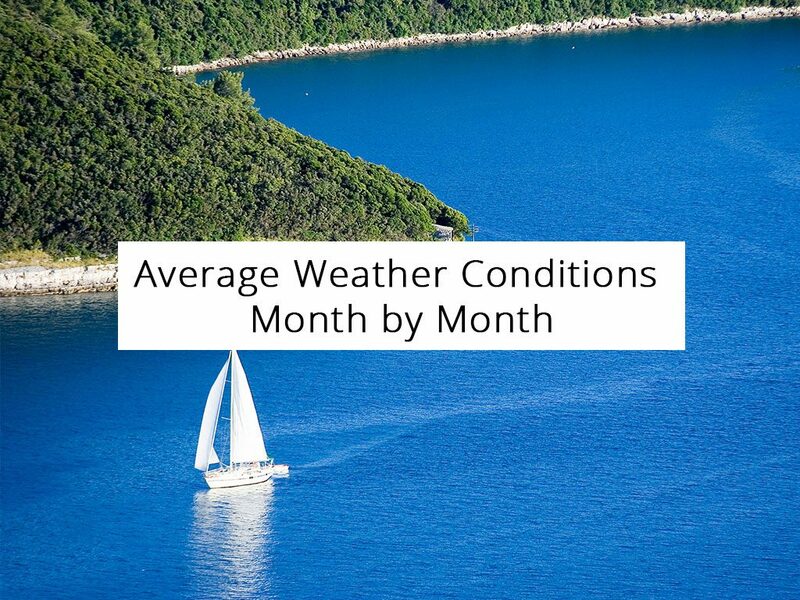 Every sailor has favorite weather conditions for sailing. And the sea around Thessaloniki and Halkidiki features diverse conditions throughout the year. And BabaSails Yachting has come up with some average values of the most important parameters in this field. 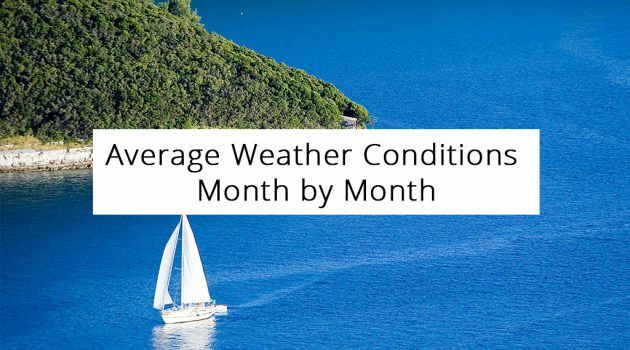 Now, it is only up to you to choose an ideal month to enjoy the beauty of the area on board the sailing boat. Water temperature: from 13˚C (55˚F) to 16˚C (61˚F). Air temperature: from 1˚C (34˚F) to 9˚C (48˚F). Wind speed: around 3.2 m/s (light breeze). Water temperature: from 12˚C (64˚F) to 15˚C (59˚F). Air temperature: from 2˚C (36˚F) to 11˚C (52˚F). Wind speed: mostly around 3.3 m/s (light breeze). Water temperature: from 12˚C (64˚F) to 14˚C (57˚F). Air temperature: from 4˚C (39˚F) to 14˚C (57˚F). Wind speed: decreasing from 3.2 m/s to 3 m/s (light breeze). Air temperature: from 7˚C (45˚F) to 19˚C (66˚F). Wind speed: decreasing from 3 m/s to 2.7 m/s (light breeze). Water temperature: from 15˚C (59˚F) to 22˚C (72˚F). Air temperature: from 12˚C (54˚F) to 25˚C (77˚F). Wind speed: mostly around 2.7 m/s (light breeze). Water temperature: from 21˚C (70˚F) to 26˚C (79˚F). Air temperature: from 16˚C (61˚F) to 29˚C (84˚F). Wind speed: usually around 2.6 m/s (light breeze). Water temperature: from 24˚C (75˚F) to 28˚C (82˚F). Air temperature: from 18˚C (64˚F) to 31˚C (88˚F). Wind speed: decreasing from 2.6 m/s to 2.4 m/s (light breeze). Wind speed: typically around 2.4 m/s (light breeze). Water temperature: from 22˚C (72˚F) to 27˚C (81˚F). Air temperature: from 15˚C (59˚F) to 27˚C (81˚F). Water temperature: from 19˚C (66˚F) to 23˚C (73˚F). Air temperature: from 11˚C (52˚F) to 21˚C (70˚F). Wind speed: rising from 2.6 m/s to 2.8 m/s (light breeze). Water temperature: from 16˚C (61˚F) to 20˚C (68˚F). Air temperature: from 7˚C (45˚F) to 15˚C (59˚F). Wind speed: rising from 2.8 m/s to 3.1 m/s (light breeze). Water temperature: from 13˚C (55˚F) to 17˚C (63˚F). Air temperature: from 3˚C (37˚F) to 11˚C (52˚F). Wind speed: usually around 3.2 m/s (light breeze). Just note that temperature values may breach these limits on rare occasions. Also, the speed of the wind may drop down to 1.7 m/s and rise up to 3.7 m/s (gentle breeze).